I considered calling this post "Bath Time is Crack Time". I have never done crack (or any drugs for that matter) before, but the amount of enjoyment my children get from bath time makes me equate it to drugs. You just say "bath time" and they both go running to the tub. It's kind of funny. Lately I have mostly been bathing the kids separately. I find it easier. Less fighting and less water all over my bathroom floor. Ian enjoys the chaos that comes with bathing them together. I personally enjoy watching them each stretch out the length of the bath on their tummies. They both do it when they are alone in the tub. And Isla especially loves the bubbles. When she is alone, she takes more time to play with them. She literally took an entire bath the other night without toys. Just played with the bubbles. It was pretty dang amazing. And she played until I felt the water and realized it was totally cold. Its been a while since anyone has stayed in the bath that long around here. Though Connor used to do it as a toddler as well. Talk about the simple things in life! 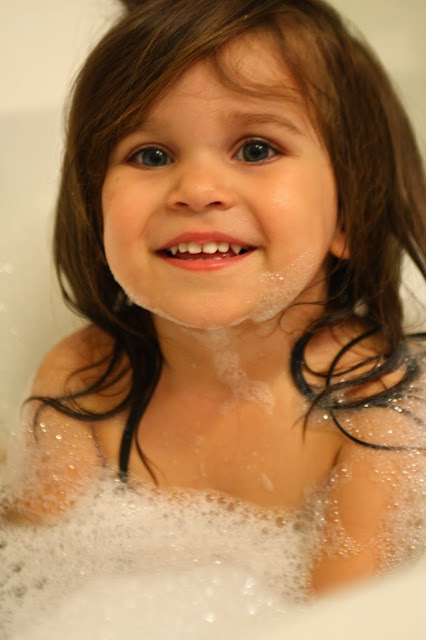 My kids enjoy sitting in a tub of their own filth, dumping water on their rubber duckies and playing with bubbles. The only way I enjoy a bath these days is when the water is steaming hot (which it never stays that way for long), with a good magazine and a good glass of wine within arms reach. I guess the simple things aren't so simple for me anymore! We love bath time here too. Those pictures of Isla are amazing. Seriously adorable! mmm, this just makes me want to soak in a bath, or a hot tub! When did Isla get so big?! She looks like such a little lady in these photos. My kids love bath time too. And I love it too because I can sit on the toilet and read while they splash. Bath time is a hit here too. The three still bathe together and make the biggest loudest messes and they love every minute. Crazy kids! !